This Garry Shead limited edition fine art original etching titled Tango 1 (One) is from the famous Tango series; its success saw a further release of equally brilliant etchings such as Tango 2 (two) Tango 3 (three) Tango 4 (four). Etching House has a full range available of these now extremely hard to find etchings. About the process of making Tango I, tango II, Tango III, Tango 4 Limited edition etching by Garry Shead. The process of multi-plate colour etching, as used in Tango I, involves the artist drawing parts of the image on each of the three plates. In other words, some information is on a plate which is inked up all over in yellow, some of the marks and tones are red and are drawn on the second plate, while the main or key information (lines and dark tones) is drawn on the key plate and printed last. To make the key plate, Garry Shead first does a loose pen drawing onto the first zinc plate. The zinc plate has on it a very thin emulsion or coating, through which Garry then scratches the line drawing. These lines expose the plate underneath, and Basil can then etch them in nitric acid to establish them in the plate. The plate is usually proofed (printed) at this stage, so the artist can see what his drawing looks like. The editioning of the prints takes place once the artist has approved the final proof. Two printers worked together on the printing of Tango I : with the printing of the 75 etchings taking around a week’s work. Some of Garry’s coloured etchings take even longer to print, owing to the number of separate plates which need hand-inking for each print. The techniques described here have been in use for around 500 years. Rembrandt is still regarded as one of the finest etchers to have lived, whilst Goya is renowned for his use of the tonal aquatint process. Basil Hall Editions and Northern Editions (where Monique also works) are two of Australia’s specialists in multi-plate colour etching. 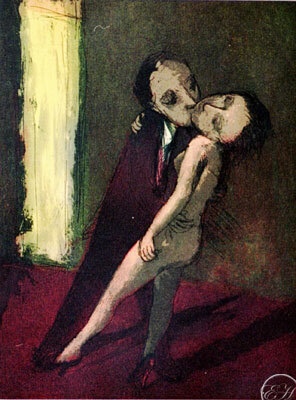 Etching House has a full range of the Tango series etchings by Garry Shead.